Kailyn Wilde comes from a long line of sorcerers, who have run a centuries old magick shop in the quaint tourist town of New Camel. When she goes to the attorney’s office to finalize her mother’s estate, she literally stumbles over his body–worst of all, he was married to her best friend Elise. As a brash detective casts the blame on Elise, Kailyn starts an investigation of her own. What with running a business, perfecting ancient spells, and keeping up with an uninvited guest of fabled origins, Kailyn has her hands full. But with the help of her uncanny black cat Sashkatu and her muumuu-clad Aunt Tilly, she’s closing in on the killer. Yoo-hoo there, I’m Tilly, née Matilda. I come from a long line of sorcerers, but don’t let that frighten you. We practice only white magick. My niece, Kailyn, asked me to stop by and say hello to all of you, because she says I play an important role in her life. I’m tickled silly that she thinks so! With me, what you see is what you get—from the red curls on my head to the bunions and corns on my feet. But they’re not what I’m best known for. I have a reputation as an inimitable psychic and world-class baker. Anyone who comes in for a reading can stay on to enjoy a traditional English tea – for a modest additional fee. I was married at one time, as were my sister, Morgana, and mother Bronwen. I was widowed at a young age. Morgana’s husband walked out one day and never looked back. My father hung in there a bit longer, but eventually he left us too. It would seem that marrying a sorceress is not an easy row to hoe. When we married, my mother, sister and I all retained our maiden name—no hyphenates for us. For hundreds of years, the name “Wilde” has been passed on from mother to daughter along with the magickal DNA in our bloodline. Perhaps that insistence on keeping the family name was the first of several strikes against our relationships that eventually struck us out. You might think that having magickal powers would be enough for any mere mortal, but my beloved niece has had a passion for murder mysteries since the day she learned to read. As a child she always had her head in a book and the book was generally a mystery. That’s why it came as no surprise to me that she made it her business to solve the first murder case in our peaceful little town of New Camel, New York. I tried to help her out in whatever ways I could, although I have to admit that it was scary at sometimes. No matter – I gathered my courage around me like one of my Hawaiian muumuus and confronted my fears head on. Except for that mouse incident. Oops — that’s the oven-timer ringing. I’ll have to say toodle-oo for now and see to my scones. Stop in for a reading sometime and stay for the three-course tea; the clotted cream comes straight from England! 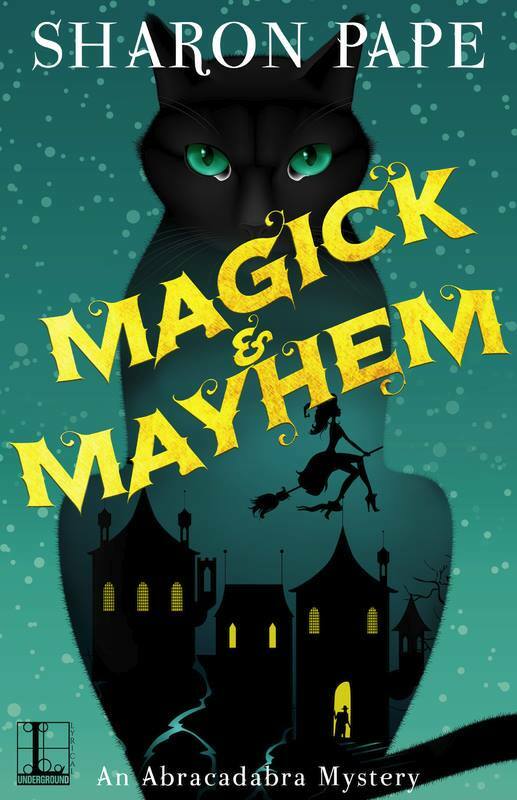 Be sure to leave a comment along with your email address for a chance to win an e-book copy of MAGICK AND MAYHEM! Sharon Pape describes her writing career as having two stages. Back in the dark ages, before computers were in every household, she had three paranormal books published. The first one was condensed by Redbook Magazine, the first paperback original they ever condensed. Then life brought her an unexpected challenge, by the name of breast cancer. After treatment she and her oncologist started a not-for-profit to provide information and peer support to breast cancer patients. With the organization up and running, she returned to her first love - writing. This time around she's writing cozy mysteries. Abracadabra is her third series. 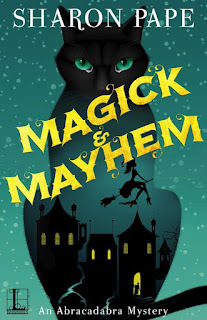 The first book in that series, Magick & Mayhem, debuted on May 2nd. To learn more, visit Sharon’s website: sharonpape.com Friend her on Facebook Follow her on Twitter and Pinterest. Ah mayhem, nothing better. Thanks for the chance. I'd love to read this. Thanks so much for the chance. Thanks for the introduction to a new series. I love a bit of 'magic' in my cozy books. This take on the paranormal, Magick shop, definitely is one to read! I married 45 years ago next month and kept my name. I checked with a lawyer friend to see if that was legal. At that time it was in all but one state. Otherwise, you had to take the husband's name and then change your name back! For 5 years when we filed our taxes I got the same postcard from the IRS asking me when I got my SS number, where, etc. Almost everything short of my eye color and shoe size! The fifth year I filled out the card and wrote a note saying, "This is the fifth time you have asked for this information. Please file it where you can find it." Sounds like a good book. I like cozier with some paranormal mixed in. Thanks for the laugh, Libby! I can't wait to read this book! Sounds like a winner! Thanks for the giveaway! Yay! A new series. Awesome! Psychic and Baker...sounds wonderful..and the Cover with that black cat looks very appropriate. Please enter me. I love ebooks as well..
Sharon Pape is a new author to me and I really enjoyed the description of the book. Would love to read. Great post, thanks for the intro to what sounds like a great new series! Thanks for the chance to win! Thanks for the chance to win a book from a (new to me) author. Tilly sounds fun!! thanks for the chance to win a new series (book) to read!! Cats, magic, murder and three course teas. Can't get any better! Cats, magic, murder and three course teas. Can't get any better. I love copies with a touch of paranormal in them. Thanks for the great review and giveaway opportunity.